If you need the inverter to run the resistive load (like TV, electric cooker, LED light), please choose the inverter with continuous power higher than the appliance's rated power. For example, for the power inverter with continuous power 2500w, it is suggested to run the appliance with rated power less than 2500w. It is best to use 80% of the rated power. If you need the inverter to run the inductive load (for an appliance such as a compressor, motor, water pump), please calculate the power of inverter 3 to 7 times higher than the rated power of your appliance. 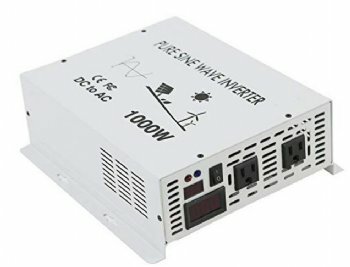 High-efficiency DC to AC Inverter converts 12 Volts DC to 1000 Watts of pure sine wave AC power at 120 Volt AC, 60HZ, 2000W Surge, Clean backup power supply in black-outs. Can work 24/7 off-grid power for camping, travel, home or office.1000W rated power solar inverter for solar panel power system as well. Features include standard protection bells or whistles, short circuit, over temperature protection, low/high battery volt alarm/shut down. Ideal car power inverter for the reliable transformation of DC power from a battery such as the one in a car or RV into AC power for lights, computers, televisions, refrigerators, medical equipment, and so on. Charge up electronics such as cell phones, laptops. Low Interference, no buzz for TV or Stereo, Silent operation, not noisy.Low idle power draw of less than 0.8 Amp. More safe with Ground connection on the bottom.Soft start design, with less surge current for good protection of your AC appliances.